Most exit polls predicted a tight race between the Bharatiya Janata Party and the Congress. Counting of votes for all 230 constituencies in Madhya Pradesh will start at 8 am on Tuesday. The state recorded a high voter turnout of 74.6% on polling on November 28. According to the Election Commission, 2,907 candidates, including 1,102 independents, have contested the elections to the 230-member Assembly. The Bharatiya Janata Party government led by Shivraj Singh Chouhan is eyeing a fourth straight term in office. The Congress, which was in power for 10 years before Chouhan took over in 2003, has not declared a chief ministerial candidate. However, Jyotiraditya Scindia and Kamal Nath are believed to be the likely contenders for the post. Scindia, the Congress campaign chief for the state, and Nath, president of the Madhya Pradesh Congress Committee, have not contested the Assembly polls as they are Lok Sabha MPs. 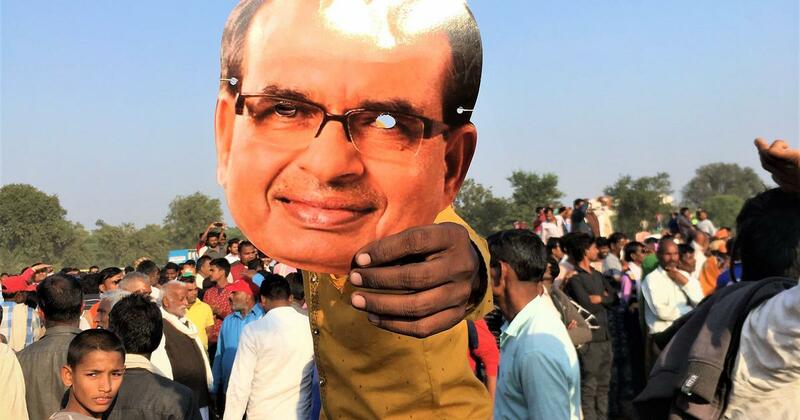 The BJP has fielded candidates for all 230 constituencies, while the Congress has fielded 229 candidates, leaving one seat – Jatara in Tikamgarh district – for its ally, Sharad Yadav’s Loktantrik Janata Dal. The Bahujan Samaj Party has nominated 227 candidates, amd the Aam Aadmi Party – a first timer in Madhya Pradesh – has fielded candidates in 208 constituencies. The Samajwadi Party is contesting from 51 seats. 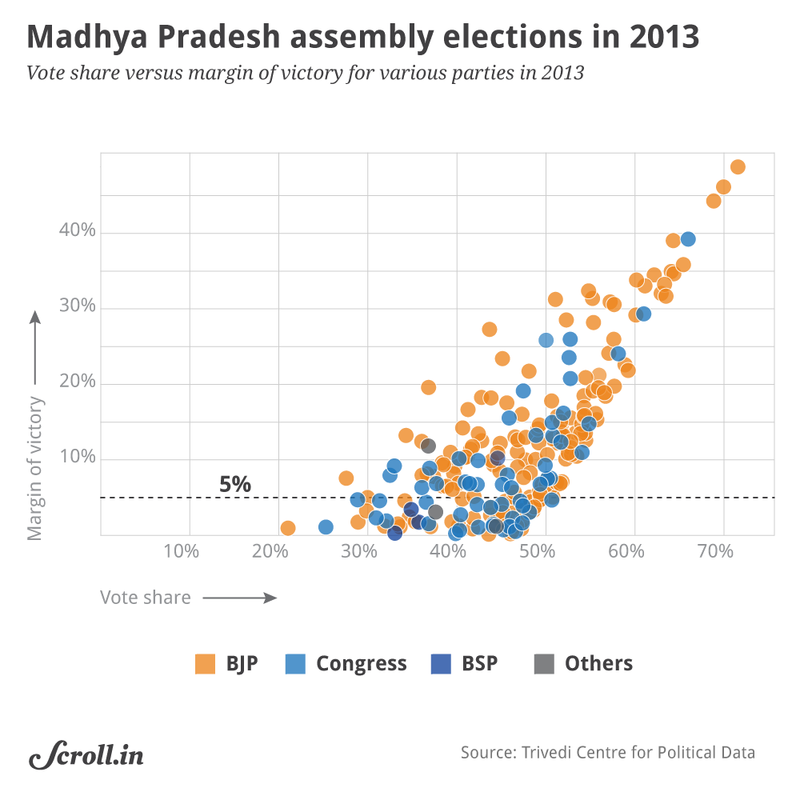 The Madhya Pradesh results will be crucial since it is the state with the most seats going to polls in this round and will be viewed as a litmus test ahead of the 2019 General Elections. Prime Minister Narendra Modi, Bharatiya Janata Party President Amit Shah and Congress President Rahul Gandhi were frequently part of the state’s high-pitched campaign rallies. The Congress president had accused the BJP of not fulfilling job promises and had claimed that the state’s youth were deprived of jobs as the government did not have the money to pay people involved in the Vyapam scam. The scam relates to the massive irregularities in various entrance and recruitment exams conducted by the Madhya Pradesh Professional Examination Board – also known as the Vyavsayik Pariksha Mandal, or Vyapam. In turn, the BJP had accused the Congress of toeing the “soft Hindutva” line after posters showing Gandhi pouring holy water on a lingam, a representation of Hindu deity Shiva, surfaced in Bhopal. The Congress also stirred up a controversy when its leader Raj Babbar compared the falling value of the rupee with the age of the prime minister’s mother. 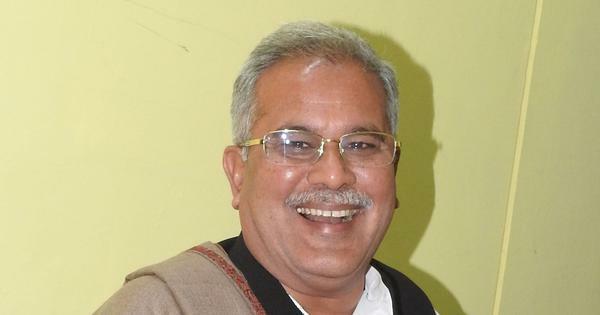 The incumbent chief minister is contesting from Budhni seat, his home turf. The Congress has fielded former Union minister Arun Yadav from there. The candidates from Mandsaur, which was the epicentre of the farmers’ agitation in the state in 2017, are the BJP’s Yashpal Singh Sisodiya and Congress’ Narendra Nahata. Former Chief Minister Babulal Gaur has held the Govindpura seat, a BJP bastion, since 1980. This time, his daughter Krishna Gaur is contesting against Congress candidate Girish Sharma there. Meanwhile, Congress leader Jyotiraditya Scindia’s mother Yashodhara Raje Scindia, minister in the state BJP cabinet, is contesting against Congress’ Siddharth Lada in Shivpuri. Digvijay Singh’s son Jaivardhan Singh is contesting from family’s bastion Raghogarh against the BJP’s Bhupendra Singh Raghuvanshi. The BJP has promised a special bonus to small farmers, five million job opportunities in five years and investment of Rs 50,000 crore in the agriculture sector. The party also promised to build cow sanctuaries in every division of the state and 50 “Gokul villages”, or ones that will be dedicated to conservation of indigenous cow breeds. The BJP, however, did not bring up farm loan waivers – a promise repeated by Rahul Gandhi at his rallies. The Congress in its manifesto promised to write off farm loans of up to Rs 2 lakh and provide a salary grant for five years to industries offering jobs to the youth. The party also promised a social security pension of Rs 1,000 per month to farmers who are 60 years old or above and whose land holding is below 2.5 acres. 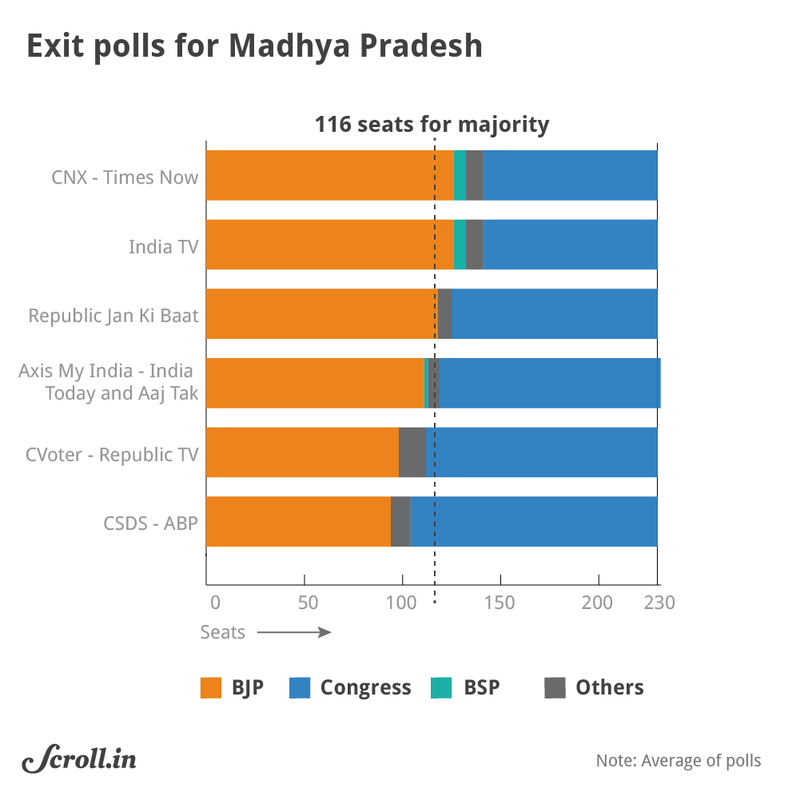 Most exit polls predicted that there would be a tight race between the BJP and the Congress in Madhya Pradesh. The BJP will win between 90 to 106 seats, while the Congress will secure anywhere between 110 and 126 seats, according to Republic TV-CVoter. India TV-Axis My India has predicted 102-120 seats for the BJP and 104-122 for the Congress. According to Jan Ki Baat, the BJP will bag 108-128 seats and the Congress 95-115. However, Times Now-CNX predicted that the BJP will win 126 seats, and the Congress will be far behind with 89. In the 2013 Assembly elections, the BJP won 165 seats, while the Congress managed to secure only 58 seats and the Bahujan Samaj Party four seats. 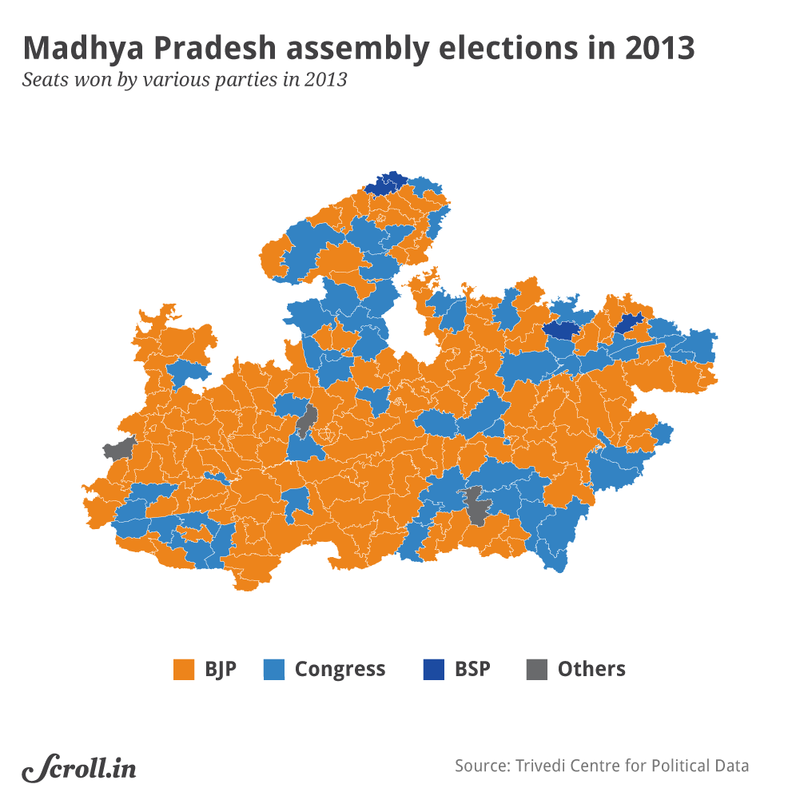 In the 2014 Lok Sabha elections, the BJP swept the state, winning 27 of 29 seats. The BJP won 165 seats in the 2013 state elections. However, they eked out 18 seats with a margin of less than 2%. The Congress captured 12 seats inside the same margin and had to settle for a relatively meagre 58 seats, handing Shivraj Singh Chouhan his third term as chief minister.